Master the updated Warwick with these handy tips! The Uncaged Wrath of Zaun may already be loose on live servers, but unlocking his true potential takes a bit of extra knowledge. We talked to EU LCS pros and a few Warwick mains to get the advice that will help you ’wick-roll even the toughest opponents. But before we jump into game and start ripping flesh from bone, let’s get our runes and mastery pages prepped for maximum carnage. Follow this guide and you’ll go from dog-like to godlike in no time! Let’s begin with jungle masteries. Nerfs to Colossus don’t impact Warwick a colossal amount since his E gives him plenty of tankiness. Fervor appears to be the superior choice in most scenarios, plus Warwick sticks to his targets so effectively with his Q that he gets more benefit out of Fervor stacks. This mastery meshes well with his kit, offering a slight bump to your health regen and synergizing extremely well with Bloodrazor (a popular pick-up). Fervor also provides stacks on your ultimate, making you stronger in combat once you engage. Roaming now to the top lane,the following build has proven effective for many of the high-elo players we’ve interviewed. Though Grasp of the Undying is not as popular as Fervor, it gives you solid sustain and trading power in short duels (a more frequent occurrence in top lane) as well as a bit more tankiness in teamfights without needing to stick to a target as long. Worth a try if you feel Fervor is not cutting it or your power level is feeling more woof than wolf in the early game. Remember: these mastery guides are not a copy-paste ‘win button’. Even though the experiments Singed performed on Warwick produced terrifying results, don’t be afraid to experiment. You might just come up with something amazing. 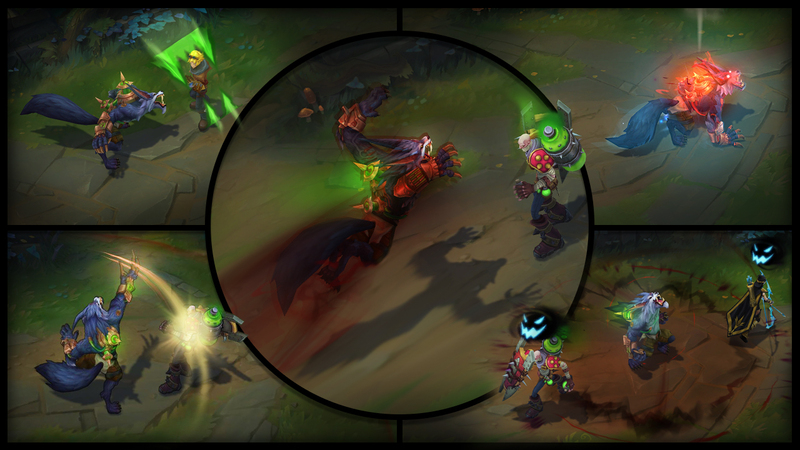 Here’s a standard rune setup for Warwick that will serve you well both in top lane or jungle. Most of the high-elo players we spoke to preferred some variation on this basic formula. Attack-speed runes shouldn’t come as any surprise since you’ll want to deliver as many melee swipes of Warwick’s claws as you can. This will also help with your jungle clear since it takes him a while to get the job done. Starting items: Machete and Rejuvenation Bead is a solid approach. Why bead? Warwick has a slow clear time, but he doesn’t lose much life in jungle with his kit providing such amazing sustain. Rejuvenation Bead will give you some HP and will build into Tiamat later on. Bloodrazor synergizes amazingly well with Warwick’s kit, as it gives you more attack speed and damage (that means more healing for you as well). It will make you far stronger in duels and also empowers your ultimate. What’s not to like? Cinderhulk is pretty self explanatory, it will make you VERY tanky. It’s not easy to take down a champion that has a lot of HP, constant healths and a damage reduction ability. Many things change in Warwick builds, but most high-elo players prefer to build Tiamat. It gives him faster clear, better push potential and an auto-attack reset on top of a direct buff to your ultimate. You can decide if you want to upgrade it to Titanic Hydra later on. Some players just leave the Tiamat there while other finish it, the choice is yours. 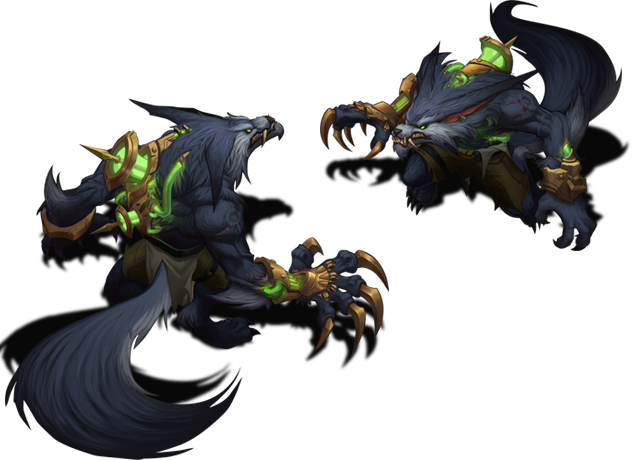 Since Warwick’s primary job on your team is to ult and chase down (or CC) enemies and not 100-to-zero them, most players prefer to build him full tank once they have completed those items. Check your enemy team and build accordingly. Do they have a lot of magic damage? Get Spirit Visage. Do you want some extra sticking power and CDR? Go-go-gadget Gauntlet. Do they have a lot of AD and auto-attacking threats? Randuin’s. Warwick is a very adaptive champion and can be built in a variety of ways. Use that flexibility to your advantage! An insanely strong 1v1 champ, Warwick can take on practically anyone and get the upper paw. While Warwick hardly loses any life in the jungle, be aware of his slow clear. This may hurt his viability as a jungler in pro play, but his ganking prowess compensates somewhat for this weakness. Warwick is hard to take down because of the healing he gets off his Q, passive and ult. Not to mention, he’s super tanky because of his E damage reduction and CC. The lower your enemy’s health, the stronger the Uncaged Wrath of Zaun becomes. If you’ve got the scent of a low-health enemy, they will find it find it almost impossible to escape from your because of how effectively your Q aids in the chase. If you time the ability right, you can even piggy-back an enemy’s flash. Combine that previous move with his W and his is arguably the single best chaser in League at the moment. If he has farm and you play the situation right, he can even manage on the occasional 1vs2 unless one of those enemies has ignite (extremely rare in this meta) or can block him from reaching the target. If you’re taking Warwick into top lane, make sure you have the right matchup… or you’re gonna have a bad time. His high sustain and 1v1 potential make him an excellent pick against tanks, especially in the current tank meta, however he is weak against all-in champions that want to play aggro (Fiora, Jayce). If they run ignite, it will be even harder for you to find an edge. Warwick has amazing snowball potential, with plenty of ways to push his lead and create picks. His range and mobility enable him to punish sloppy positioning from the enemy team. Warwick greatly benefits from move-speed allies such as Sivir or Zilean. His ult reaches farther, move-speed stacks with W, and they can help your teammates more effectively collapse on the enemy as they follow up your ult. Remember when a Warwick jungler on the enemy team meant you were 100% safe till he hit level 6? Well, those days are over. New Warwick can be a legit ganking menace pre-6. He can choose when and where to activate his W move speed. Combine that with CC potential and a Q that makes him almost impossible to shake and his gank efficiency goes way up. Make sure you itemize the right way against Warwick, as most of his damage is magic. Be sure to build some MR if you fall behind. And a friendly Mortal Reminder (sorry): Warwick heals with almost everything he does. In a metagame that’s put the ignite spell on the back burner, having a heal-reduction item such as Morellonomicon or Mortal Reminder is just about mandatory if you want to take him down. Remember that hanging around lane with low HP, regardless of which lane you’re in, will give Warwick a terrifying speed boost. Routes and ganks that might be too slow for other champions are a (swift) breeze for Warwick if you give him the opening. If you are low, just go back to base and don’t take risk being wolfed down! Always be ready to interrupt Warwick’s ultimate. Even though his pounce is invulnerable, you can CC him the moment he lands on your ally. Once his E is on cooldown, you can burst him pretty fast if you focus him.